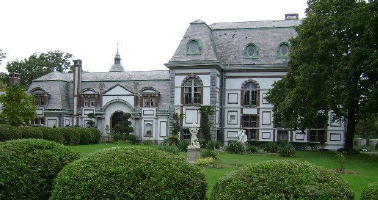 Belcourt Castle is the former summer cottage of Oliver Hazard Perry Belmont, located on Bellevue Avenue in Newport, Rhode Island. Begun in 1891 and completed in 1894, it was intended to be used for only six to eight weeks of the year. Designed in a multitude of European styles and periods, Belcourt was designed with heavy emphasis on French Renaissance and Gothic decor, with further borrowings from German, English and Italian design. In the Gilded Age, the castle was well noted for its extensive stables and carriage areas, which were incorporated into the main structure. Belcourt does not necessarily seem to be haunted by its owners or any members of the large staff that worked there for decades. Rather, it seems Belcourt is haunted because of some of the antiques in its collection. Furnished with art and trappings from more than 30 different countries, Belcourt has a lovely Gothic ballroom featuring haunted chairs. Some visitors have reported feeling chills race up and down their spine while standing near the chairs, others have reported strange sensations of energy moving across their hands. Supposedly if you try to sit in one of the haunted chairs you’ll feel resistance, while trying to take a seat in the other may just get you tossed out of it. There is also a screaming suit of armor in the Gothic ballroom. The original owner of the armor was killed by a spear entering the visor’s eye slit. People claim the owner’s screams can still sometimes be heard around the time he died in March. A carving of a monk is also supposedly haunted by its ghostly counterpart—so keep your eyes open. Cameras are not generally allowed in the castle , but a few people who sneaked photos (at risk of having their camera taken and being kicked out of the tour, so don’t do it) claim they have proof of orbs in several rooms.